My husband is not terribly fond of broth generally, when I serve soups and stews, he tends to leave broth in the bowl rather than finishing it. Since he has joint pain, I want to get a big dose of gelatin and minerals in him as often as possible. This recipe fits the bill as it gets a lot of broth down him painlessly. It's also a refreshing summer recipe when you're not in the mood for soups and stews. Risotto makes a nice side dish, as once you've got the technique down, you can easily change the broth and seasonings to go with your main dish. Alternatively, you can add leftover poultry or cooked beans and make it a meal. Unfortunately, it doesn't reheat well, so it's better to make the amount you need and plan to do without leftovers. But given that it is a handy clean-out-the-fridge kind of recipe, you make it when you're trying to use up leftovers rather than create them. I tend to halve this recipe since there's just two of us. White rice doesn't have much nutrition. Brown rice contains more nutrients, but has a high phytic acid content, and having very little phytase, soaking doesn't help much. So the nutrition in brown rice is largely unavailable. In either case, rice is just not a nutrient-dense food. I ate brown rice my whole life and never liked it much. Having discovered it isn't any more nutritious after all, I switched to white, which is cheaper, faster to cook, stores longer and is tastier. So I'm going to suggest white rice for this recipe, but not the long-grain stuff you buy in bulk. The cheap long-grain rice is great for many uses, for example, it makes a nice pilaf. But for risotto, you really need a particular type of short or medium grain rice. 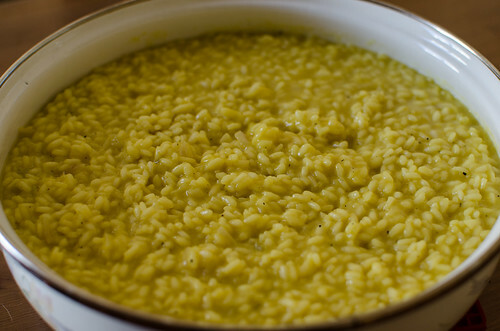 A high-amylopectin and low-amylose content in rice makes the starch dissolve as you cook it; this is what gives risotto it's characteristic creaminess. Appropriate rice varieties include Arborio, Carnaroli or Vialone Nano. These are more expensive than regular long-grain white rice, but so worth it! Melt 2 TB of butter and the olive oil in a Dutch oven over low heat. Add greens, shallots and garlic and cook very slowly until softened, about 10-15 minutes. Meanwhile, put the broth and water in saucepan; bring to boil then lower heat to a slow simmer. Add rice to vegetables, increase heat to medium and stir constantly until rice begins to look translucent. Add wine and stir until it is nearly absorbed/evaporated. Add a ladleful of hot broth to rice and adjust heat down so it is just simmering. Stir until the broth is nearly absorbed, then add another ladleful. Continue adding broth a ladleful at a time with constant stirring, the broth should almost, but not completly, cover the rice after each addition. With the last addition, add poultry or beans, if using. Season to taste with salt and pepper. Remove from stove and stir in 3 TB butter and the Parmesan. Cover pot and let rest for 2 minutes. Stir and serve.